Engines don’t have hearts or souls. They can’t keep going out of loyalty or break down as an act of rebellion, but are essentially straightforward things that depend on a sequence of simple processes to keep going. 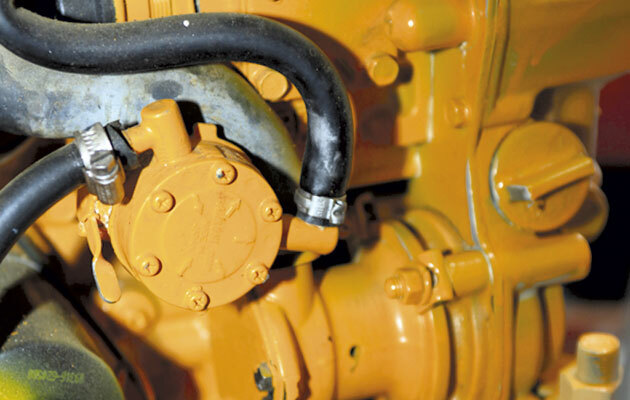 When a diesel stops, it is because something has interrupted one of those processes. If you can identify the process and put it right, there is a good chance that you will be able to get the engine going again. If you can’t, you may still be able to help the engineer to help you, by giving him a bit more to go on. 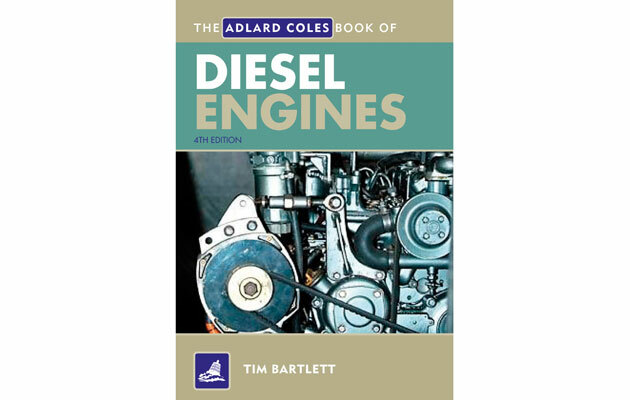 In the core of the engine, the most basic process of all involves a tiny quantity of atomised diesel fuel combining with a much larger quantity of air, in what is sometimes described as a ‘controlled explosion’. This happens in a vertical tube, the cylinder, which is machined into the metal block that makes up most of the weight of the engine. 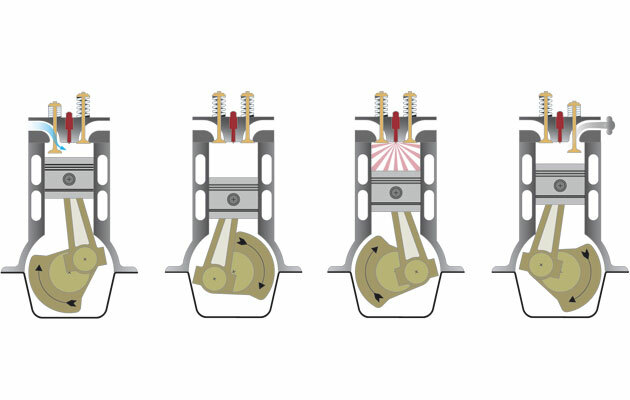 The top of the cylinder is sealed by another heavy casting called the cylinder head, through which run various passages that carry air into the cylinder and exhaust gas out of it, with spring-loaded valves controlling the flow. The bottom of the cylinder is sealed by a piston. It’s a close fit inside the cylinder, but it is free to slide up and down. As the air and fuel burn they get hot and expand, driving the piston downwards. Underneath the piston, connected to it by a ‘con rod’ (connecting rod) is the bit that does the real work. 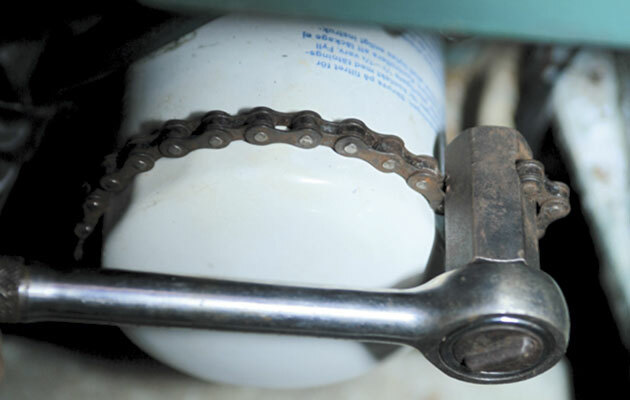 It’s called the crankshaft, and converts the downward movement of the piston into a rotary movement, just as the pedals and crank of a bicycle convert the movement of the rider’s legs into rotary movement of the chainwheel. The whole process – pistons going up and down, the crankshaft going round and round, valves opening and closing, and tiny squirts of fuel being sprayed into the cylinders – happens dozens of times a second, but we really don’t need to bother about it here. If these parts fail, there is nothing a DIY mechanic can do about it on board. We can, however, make sure the engine’s vital support systems are functioning: fuel, oil, air, and water. If the oil warning alarm sounds or the warning light comes on, do not delay: stop the engine at once, unless doing so is likely to be more dangerous or expensive than a wrecked engine! The most likely problem is low oil level, easily rectified just by adding oil. Check the oil level just as you would check a car’s oil level, using the dipstick, and top it up through the oil filler cap on top of the engine. 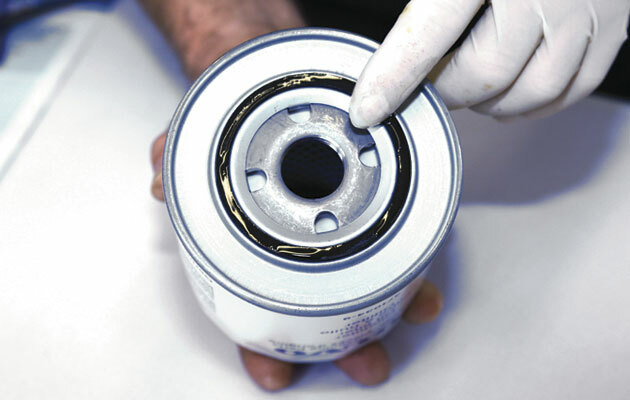 The other likely cause of low oil pressure is a clogged oil filter, for which the cure is to change the filter. If you change the filter, you should change the oil as well. This is unlikely to be possible at sea, so make your passage to shore as direct as you can. Meanwhile, if topping up the oil and changing the filter have not cured the problem, it is not worth risking the engine by starting it. This is what sails and anchors are for! From the tank, the fuel may pass through a pre-filter. Not all boats have one, but the idea is to trap the worst of any water and dirt in the fuel before it reaches the engine. Then, the fuel passes to the lift pump, usually low on one side of the engine. 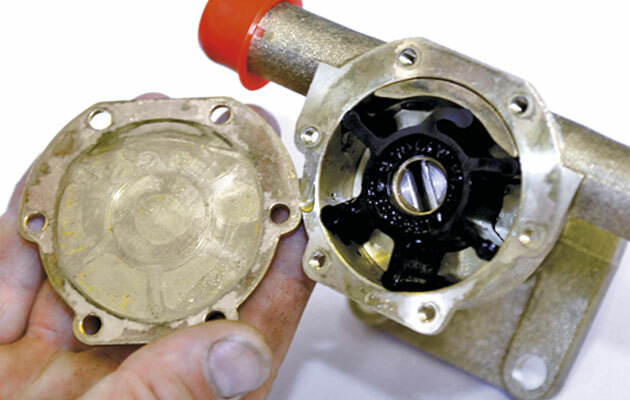 Like a miniature diaphragm bilge pump, it pushes the fuel through the fine filter and on to the injection pump. The injection pump is responsible for delivering squirts of fuel to each cylinder at precisely the right moment. The quantities involved are tiny – typically about a twentieth of a drop in each squirt – but they have to be accurately measured and at enormously high pressure. To do all that calls for very high precision machinery – and that, in turn, means the fuel itself has to be scrupulously clean. One possible contaminant is air. If air enters the injector pipes, the engine will stop because the air will act as a shock absorber, preventing the fuel pressure from rising high or quickly enough to be sprayed into the cylinder. 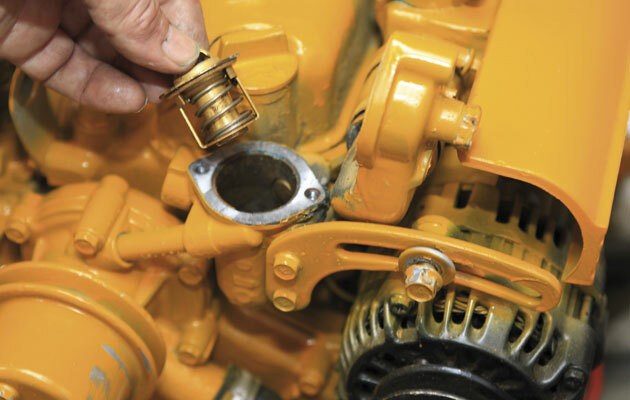 This is a common problem that is easily solved by bleeding the fuel system of air. Try to stop the leak that has allowed air into the system: it is most likely to be between the tank and the lift pump. The fuel system is designed so that any air that gets into it will be trapped at one of a handful of high points – usually one on top of each filter, and sometimes one on top of each pump. Each high point will have a bleed screw: it looks like an ordinary bolt, but has a hole drilled in it that allows air to escape when it is unscrewed a few turns. 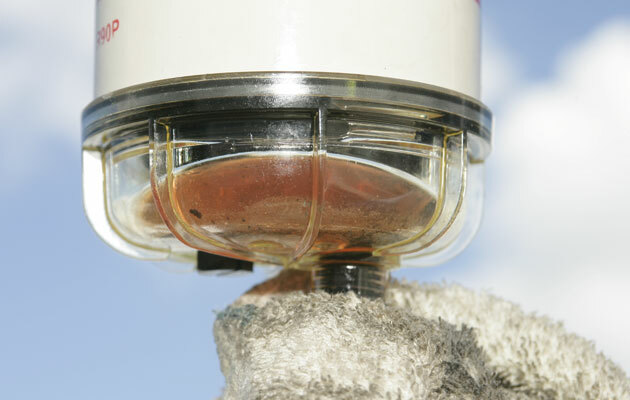 It’s a good idea to identify the bleed screws in harbour, in daylight and with the manual in your hand, and mark each one with a dab of paint, so that you can easily find them again! To bleed the system, first make sure that there is plenty of fuel in the tank. Then, starting at the tank, release each bleed screw in turn, until clear fuel flows from it, using a jam jar or bean tin to catch any excess. When clear fuel flows from the screw, tighten it and move on to the next. For the pre-filter and lift pump, fuel should flow from the tank by gravity, driving the air out. 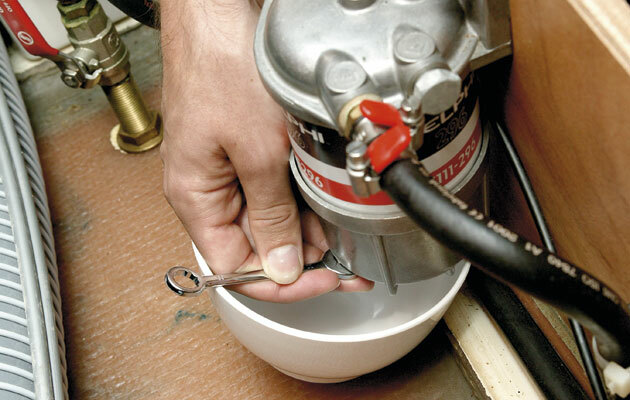 Do not try to pump it through by hand or by using the starter motor: you will make matters worse by sucking air in. Once you have worked your way past the lift pump, you can use the lift pump to force fuel through the system. Having bled the system at all the bleed screws, the engine will usually start, and will soon run normally. If it does not, you may have to bleed at the injectors. 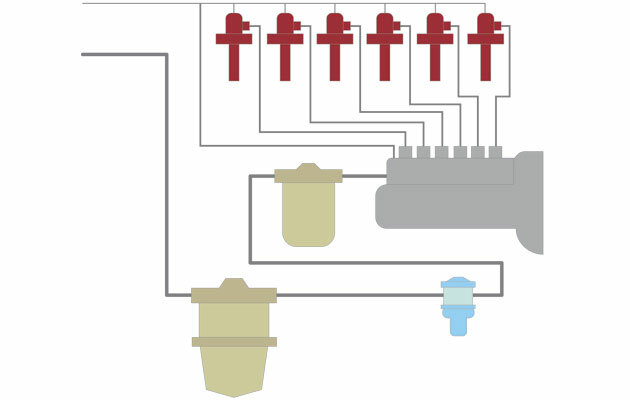 This involves slackening the union (big nut) that holds the pipe from the injection pump onto the injector by one turn, then operate the starter until you see liquid diesel appearing at the union. Then tighten the union back up. 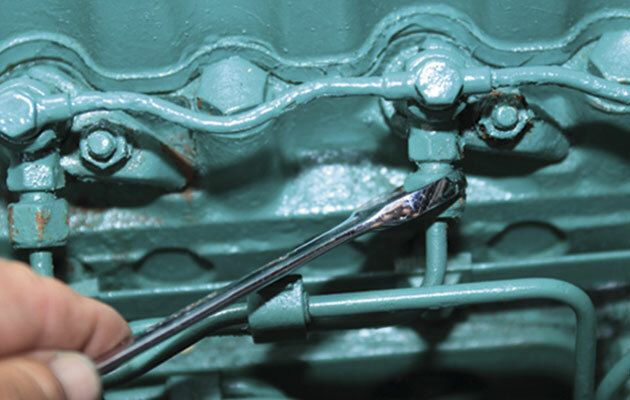 Some mechanics tighten the union while the starter is still being operated: if you choose to do this, don’t be surprised if the engine starts to run immediately! Water is another possible contaminant. If water reaches the injectors, the engine will stop. You will need to drain off any water that has collected in the pre-filter, replace contaminated filters, and bleed the system to remove any water. If you have spare filters on board, you may be able to get the engine going again, but this is a potentially serious problem, that could have caused expensive damage to your fuel system long before the engine actually stops. Most pre-filters have transparent bowls, through which water or dirt should be clearly visible, and drain-off taps at the base. To drain the pre-filter, make sure that the fuel tank is topped up, then put a suitable container such as a jam jar under the drain-off tap. Open the tap until all the contaminated fuel has been drawn off, and clean fuel can be seen flowing into the jar. Then shut the tap. The symptoms above can also be caused by clogged filters. The only cure is to replace the filter, so you should always carry spares. If you find a treacly goo in the filter, it is a sign of diesel bug, which requires chemical treatment. 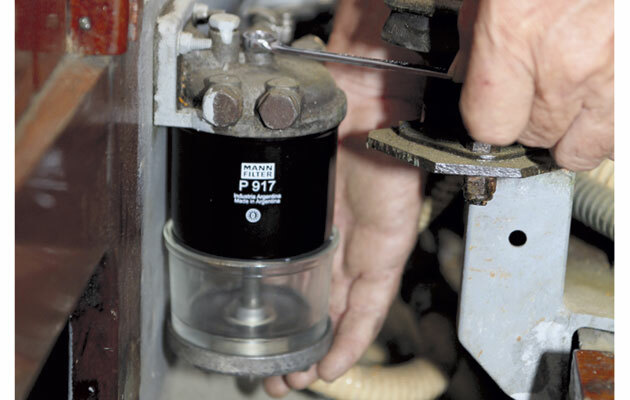 There are three common types of oil or fuel filter – spin-on, cartridge and element. The spin-on type is now virtually standard for oil filters, and is widely used for fuel. It consists of a metal canister that is unscrewed in one piece using either a strap wrench or a dedicated filter removal tool. Take care not to leave the rubber sealing ring stuck to the filter head on the engine! Apply a thin smear of oil to the rubber seal on the new filter, and screw the whole thing onto the threaded tube that sticks out of the filter head, until the rubber seal touches the filter head. Then tighten it a further half turn – no more – by hand. The cartridge type is often used as a fuel pre-filter, and is usually in three parts, held together by a long central bolt. Pre-filters can usually be emptied by opening the drain tap at the bottom and loosening the bleed screw at the top, and allowing the contents to run out into a suitable container. Otherwise, use a plastic bag or a bucket to catch the filter contents when you unscrew the centre bolt, and allow the filter bowl and cartridge to drop away from the filter head. Replace the cartridge, and put the whole thing back together again, taking care to replace any rubber sealing rings. The element type consists of a replaceable element inside a non-replaceable body. Details vary: some are held together by a central bolt, others by a retaining ring round the outside of the body, but the basics of replacing the element are always the same: unscrew the body, using a jam jar or bean tin to catch any spillage, then remove the element from the bowl (taking note of any sealing rings, springs or washers) and reassemble it with a new filter element. Note: Before changing a fuel filter, shut off the fuel supply at the tank. Afterwards, open the fuel supply, and bleed the system to remove air. When changing an oil filter, particularly one that is horizontal rather than vertical, be ready to catch the oil that will run out of it. If possible, partly fill the new filter with fresh oil before you fit it, and be sure to check and top up the engine oil afterwards. Less than 40% of the energy produced by burning fuel in an engine reaches the propeller. Most of the rest is unwanted heat – heat that has to be got rid of to stop the engine from catching fire or welding itself into a useless lump. Some engines use sea water (usually called raw water) to cool the engine directly. 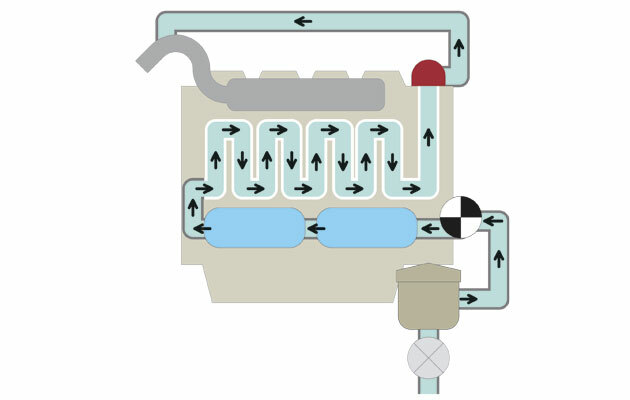 Sea water enters the system through a seacock and strainer, and is pumped through passages in the engine block and cylinder head to absorb heat, before being mixed with the exhaust gas in the ‘injection bend’. 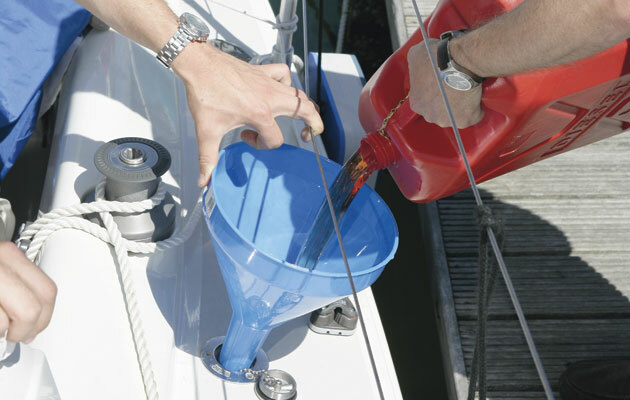 As it mixes, it cools the exhaust gas, so that the water/steam/exhaust mixture can pass safely through a flexible hose and out of the boat. Hot seawater, however, is incredibly corrosive, and there’s the added problem that a raw water cooling system can be so efficient that the engine never warms up to its ideal operating temperature. 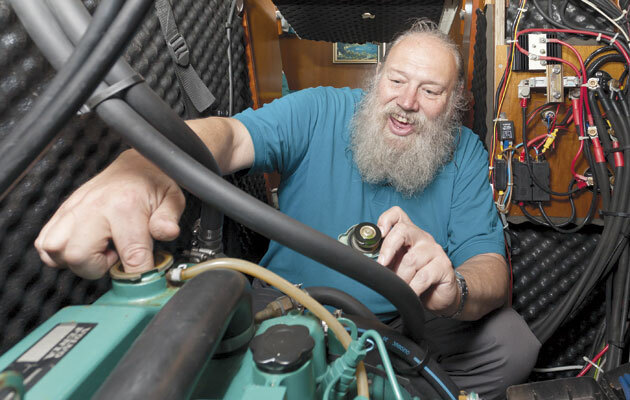 Most marine engines today use a more sophisticated indirect cooling system, with the engine cooled by a fresh water and anti-freeze mix, just as it is in a car. The only difference is that instead of using air flowing through a radiator to cool the coolant, a marine engine uses raw water flowing through a heat exchanger. 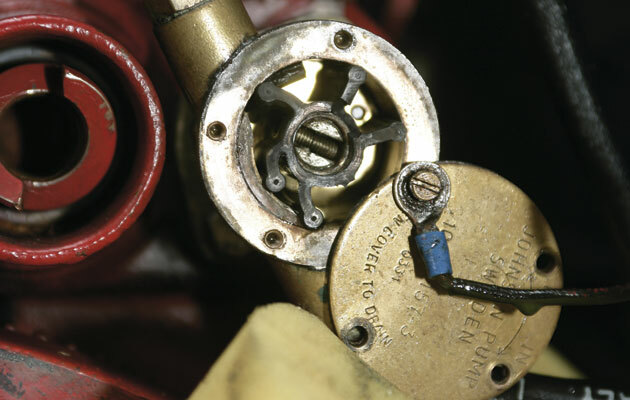 If you suspect overheating, the first thing to check (because it’s easy to do, rather than because it is particularly likely) is to make sure the belt that drives the raw water pump hasn’t broken. If it has, the only solution is to replace it. The principle is exactly the same as replacing the fan belt on a car, but the details vary a lot from one engine to another. The next check is that the seacock is open and that the strainer is clear. Again, strainer designs vary, but in general, the procedure is to shut the seacock, unscrew the top of the strainer body, remove the strainer element, rinse it, and reassemble the whole thing. Remember to open the seacock afterwards! If there was no visible blockage or clearing the blockage does not clear the symptoms, the next most likely problem is that the raw water pump has failed. This often happens right at the beginning of the season, or after the engine has been started with the seacock shut. If you have a spare impeller on board, it is a fairly simple job to fit it in place of the old one. First shut the seacock. Then locate the pump by tracing the pipework from the raw water strainer, or by looking for the only piece of brass on most modern engines. 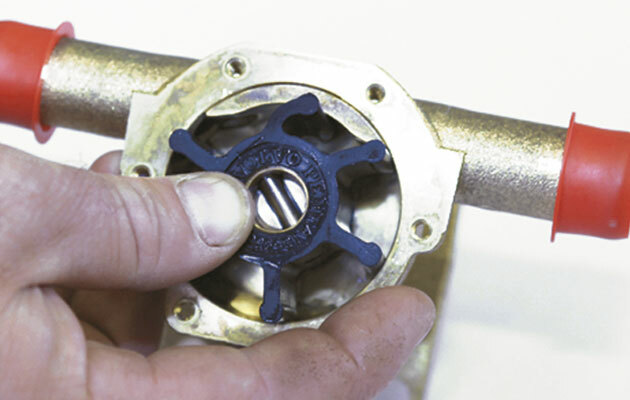 Remove the half dozen or so screws that hold the brass face plate onto the body of the pump, and pull it away – making sure to remove the remains of the paper gasket as well. 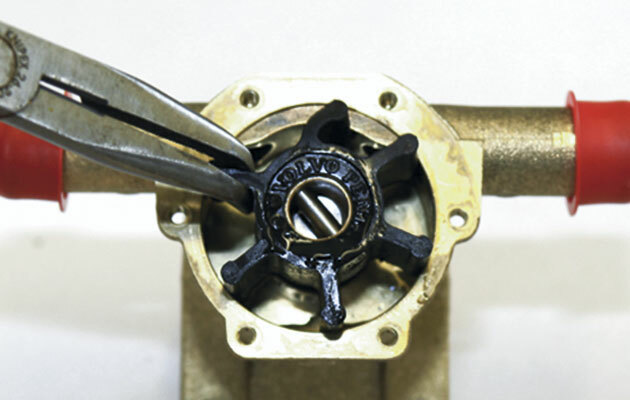 Use a pair of water pump pliers or two screwdrivers to prise out the remains of the old impeller – taking care not to damage the soft metal of the pump body – and fit the new impeller in its place. Make sure the vanes of the impeller curve the right way: they should curl backwards like the sparks from a catherine wheel. Then fit a new gasket to the face plate and open the seacock. Do not check the coolant level, as I am doing here, if the engine is hot! The commonest problem afflicting the fresh water side of the cooling system is a lack of coolant – and the obvious solution is to top it up. 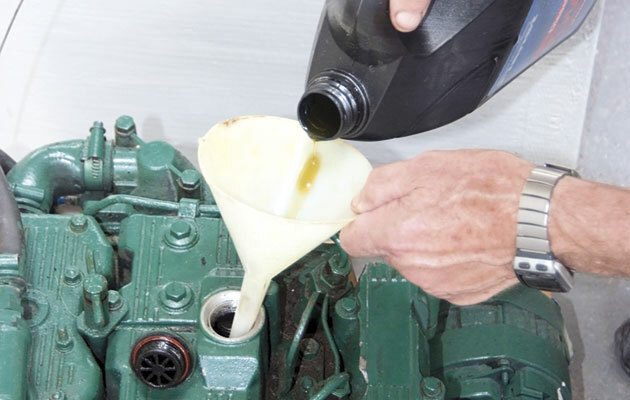 If possible, do it when the engine is cool, and use a mixture of fresh water and antifreeze. The filler point usually looks very much like a car’s radiator cap, and is probably the highest part of the engine: to unscrew it, push down against the spring, and turn it about half a turn. The water level should be within a couple of inches of the filler – if you can touch it with one finger, that’s fine. Be very, very careful if the engine is hot. You may get a spurt of steam or near-boiling water: cover the filler cap with towels to minimise the risk! The other common problem with fresh water cooling systems is the thermostat. This restricts the flow of coolant when the engine is cool, so as to let it warm up quickly. Unfortunately, thermostats can jam shut, so they continue to restrict the flow even when the engine is warm. 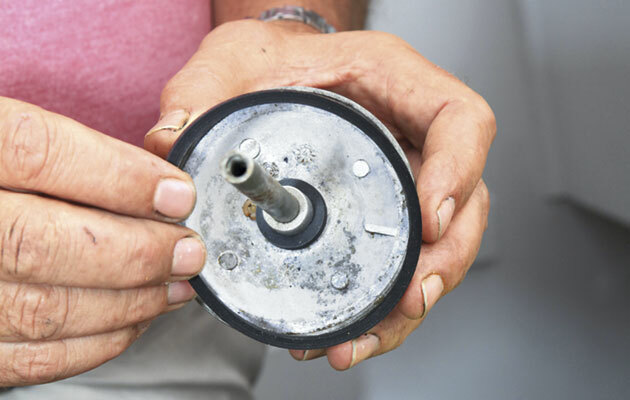 There’s nothing you can do to repair a defective thermostat, but if you can locate it (usually under a dome-shaped cover, fairly close to the water filler cap) and have the confidence to remove it, the engine will run perfectly adequately without it. The anatomy of an air intake silencer/filter varies, but there is generally a plastic or metal casing that you will need to dismantle (it’s often easiest to remove it first) to reveal the element. A clogged paper element will have to be replaced with a new one, but as a ‘get you home’, you can leave it out altogether for a few hours. Foam or wire mesh elements can be washed in water and washing-up liquid and dried. 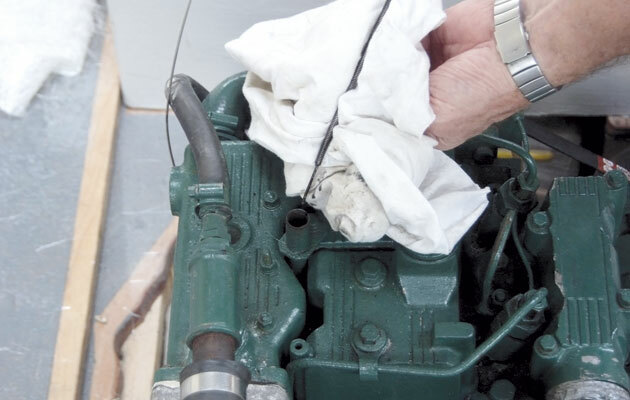 Some manufacturers suggest oiling the filter before reassembling it into its housing and refitting it.But bear in mind that it is not necessarily the filter that may be restricting your engine’s breathing: look out for engine compartment vents blocked by drying tea towels or foul-weather gear. age or because it has been damaged by lack of cooling water.